Check out our way of doing appliqués it saves so much time, and makes it so easy! Step 1) Hoop your fabric with stabilizer as you would for any other embroidery design then run your machine. 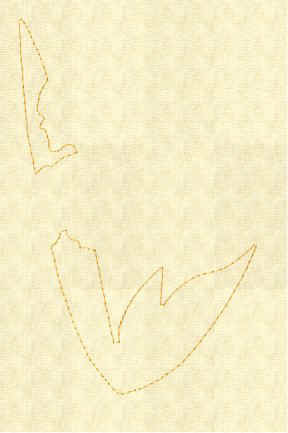 Most designs then will run an outline of an appliqué area as shown below. Some designs may put some thread colors down first. Thread color is not important for outlining appliqué area and tying the appliqué fabric down, generally a light or neutral color is used. Step 2) Next lay ironed fabric that lays flat over the outlined area. Some people will tell you to use adhesive spray to hold fabric in place as you run your machine’s next step. But you can use your hands to hold the fabric and make sure it doesn’t move or pucker. Step 3) Next remove the hoop from the machine, DO NOT UNHOOP your fabric. 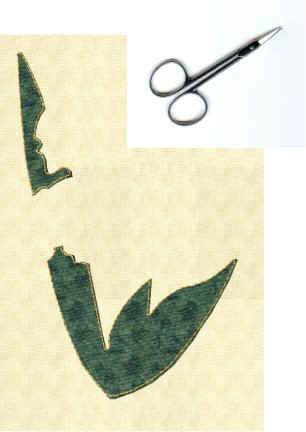 Cut the appliqué fabric with a small sharp curved pair of scissors or appliqué scissors. Be careful not to cut the thread that holds down the appliqué fabric, also be careful not to cut your fabric that you have hooped. Try to cut as close as possible. Do not have more than 1/8” of an inch of fabric beyond the appliqué line. We have found that the Ginger small curved scissors worked best as shown below. Step 4) Reattach your hoop. Then run your machine most designs will lay all appliqué material first then apply thread to the design. You do not need to change thread while laying down all the appliqué material, even though you see different neutral thread colors on your machine. If you get confused about what color of fabric you need to use for an appliqué area, refer to the attached files sent with your collection or look at the images on our website. 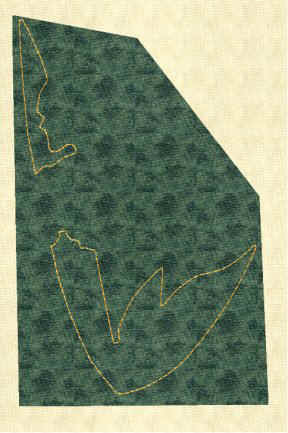 Finish all appliqué material as shown below. Step 5) Next run you thread color changes on your machine as directed by the design, and finish the design. 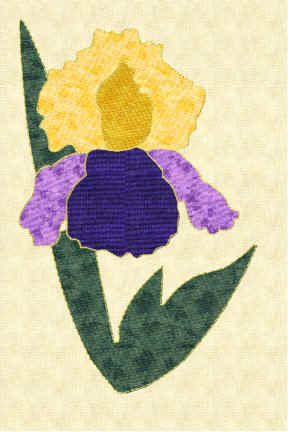 After you get comfortable with appliqué Embroidery, you will be choosing your own fabrics and colors of thread to match. One design can be done hundreds of different ways by changing fabrics and thread colors. One design can be 32 different quilt blocks if you want. Have fun! Step 6) You’re well on your way to being a pro. It’s a very easy form of machine embroidery that will give you many years of enjoyment and great unique projects!